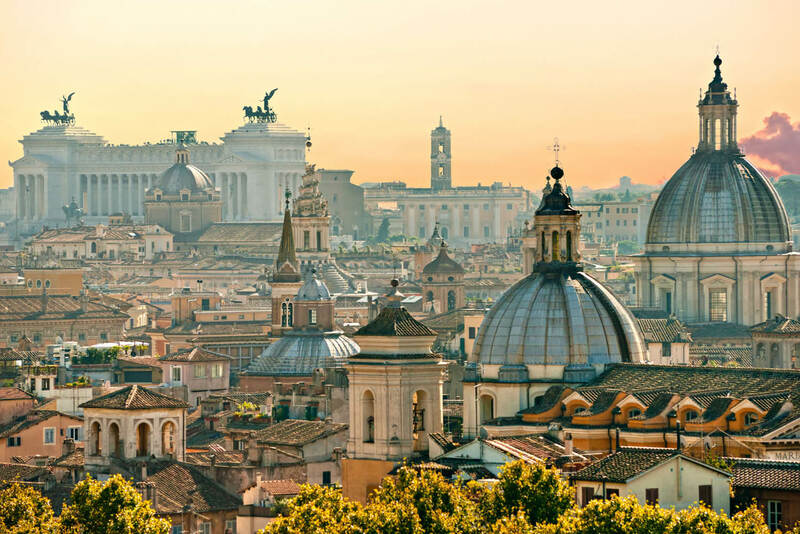 The sheer number of history-making monuments (think the Colosseum, St Peter’s Basilica, the Roman Forum) combined with a zesty lust for life, love and pasta make Rome irresistible. It’s time to do as the Romans do in the Eternal City, with our guide to eating, drinking, shopping and everything in between. The Leonardo Express train (treno), which sadly does not lead to Mr DiCaprio, will get you to Rome Termini Station in comfort. Departing from Platform 24 every 30 minutes, this non-stop, first class service takes around 30 minutes and costs only $16. Terravision runs buses (autobuses) every 20 minutes. Travel time is 40 minutes and it’s only $6. Taxis can be expensive with a set fee of $58 from Leonardo da Vinci and $43 from Ciampino with a luggage fee of $1.50. Make sure they have a ‘SPQR’ city coat of arms as Roman taxi drivers are known to take tourists for a bit of a ride. ATAC buses are the only public transport option in the ancient centre with services running from around 5:30am til midnight. Be sure to validate your ticket on board to avoid on-the-spot fines. A ‘Metrebus Ticket’ is from $9 for a day to $35 for a week; they can be used on metro, buses and local trains and are available to purchase at metro stations, newsstands and kiosks. Don your Roman sandals – or some comfy walking shoes – and hit the pavement. Book a hotel in a central area like Piazza Navona for reasonable walking distances to the major sites: Pantheon (7 mins), Trevi Fountain (14 mins), Spanish Steps (18 mins), Colosseum (25 mins), Vatican (28 mins). Enjoy a gelato in front of the iconic Trevi Fountain. You’ll pay around $1.50–6 per slice. You’ll pay around $3–6 for a scoop. You’ll pay around $4.50 for a glass. You’ll usually pay around $1.50 for a coffee. Drink standing at the bar as it costs less than sitting at an outside table. You’ll also pay around $1.50 for a bottle of water (acqua), $4 for a beer (birra), $4 for a sandwich, $20 for a meal. Around 30 kilometres from the heart of the city, Rome’s forgotten harbour city, Ostia Antica, was once a thriving port at the mouth of the Tiber River. Some of the ancient ruins date back to the 4th century BC. $12 entry; guided tours also available. A short stroll from the Colosseum, this relatively unknown Renaissance-era basilica is well worth the visit for what is hidden beneath its surface. In 1857 excavations uncovered a fourth-century cathedral below the street level site; and below that again, a first-century building. Incredibly, there are also remnants of a fourth stratum that was destroyed by fire in 64AD. The main church is free to enter, but the lower levels cost $7. A delightful open air market with flowers, fruit and veges and the scent of fresh pizza lingering in the air. The streets of Trastevere, just south of Vatican City, come alive every Sunday with peddlers selling all sorts of knick knacks. Vintage reigns supreme here: scour around for retro sunglasses, second-hand designer clothing, hard-to-find records and used books. Sundays, 7am–2pm. Get here bright and early to beat the crowds! Starting at the base of the Spanish Steps, this hub is arguably known as Rome’s swankiest shopping street. Max out your credit card or fog up the windows at designer stores like Louis Vuitton, Versace, Armani and Dolce & Gabbana, to name drop a few. Piazza Navona is a great central spot to base yourself. This maze of narrow alleys, dating from the Middle Ages, is buzzing with sidewalk cafés and bars, street artists, musicians and some magnificent architecture. Hotel Adriano deluxe room with terrace. Located just steps from the Trevi Fountain, this cosy and neat hotel has smaller classic rooms to larger apartments. Our fave is the deluxe room with its private terrace boasting views over Rome’s roof tops. This family-run hotel is worth booking for its view of the Pantheon alone, which is literally a stone’s throw away. All 26 rooms have been recently renovated. The sister property of the gorgeous J.K. Place Capri is an elegant newcomer to Rome’s luxe landscape. It is located a stroll from Via Condotti and the Spanish Steps beyond, and boasts a mix of contemporary and antique designs. This hotel is part of the Lungarno Collection, founded by Salvatore Ferragamo, and is located above his store on the prestigious Via Condotti. There are 14 unique guest rooms, some with views over the Spanish Steps, and a gorgeous rooftop terrace with an open fire. 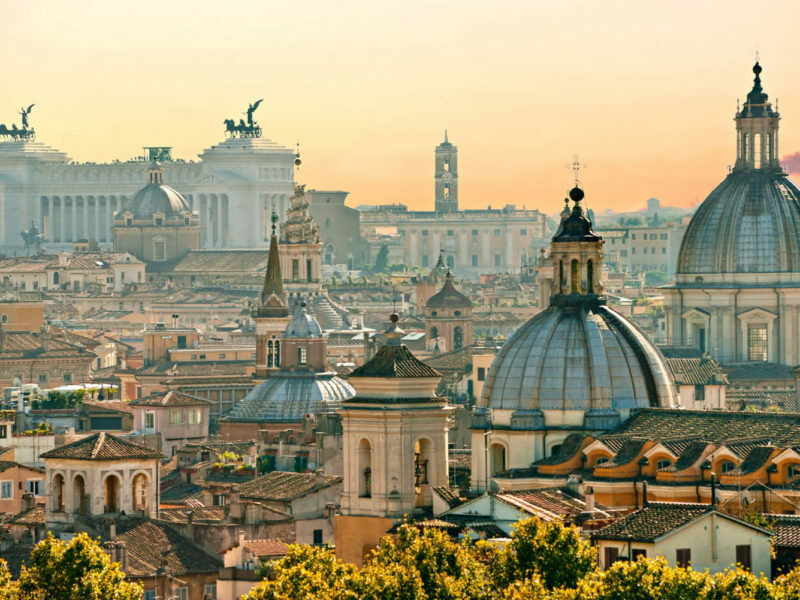 If you like the look of a Rome getaway, make sure you check out our Rome travel guide, so you can ensure you read up on the very best the region has to offer!